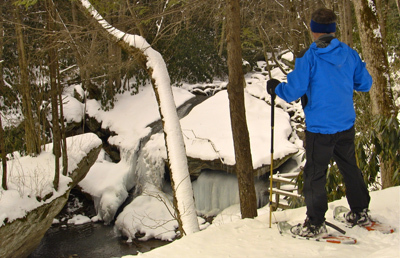 The Town of Seven Devils invites you to enjoy the Otter Falls Trail, an outdoor adventure right here in town. The path is graded, relatively gradual, and has a smoothed surface—but it is steep in spots. The hike descends about 230 feet to the falls—so you will have an identical climb back to your car. Sturdy hiking boots or shoes are recommended. Don't forget to dress properly and bring plenty of water when going on a hike! The trail leaves the parking area on Skyland Drive (elevation 3,840') and descends onto four (4) colored trails, consisting of two (2) loops, and two (2) dead end trails. Each trail is marked with red, blue, yellow, or orange markers on wooden posts. Benches are provided at each intersection, and also at dead-end viewpoints. There is an observation platform near the Falls at an elevation of 3,620'. 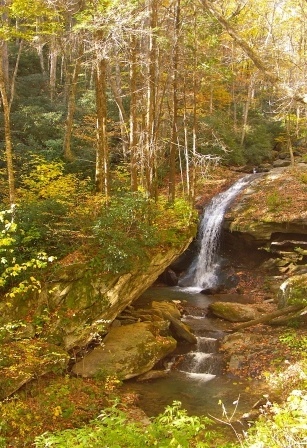 In spring, summer, and fall, the hike to Otter Falls waterfall leads through cool mountain forest. In winter, snow and ice are common. The Park may be closed in extreme weather, so check our Town website Alerts page for updates. We hope you enjoy Otter Falls in every season. Click here to download your own trail map or stop by Town Hall to pick one up!